York River Conservation Society Monster Jumble Sale! It’s that time of the year again. We will be holding our annual Monster Jumble Sale on Easter Saturday the 20th of April. Have you got any unneeded items? We would love to take your donations and put them towards a worthy cause. Anything and everything goes! Phone Audrey on 0418 378446 for pick up or leave outside the conservation centre at the Sandalwood Yards before the 20th April. Raising awareness about conserving and protecting our local flora. The Jumble Sale will be held on the 20th April at the Easter Peace Park Markets. We hope to see you there. 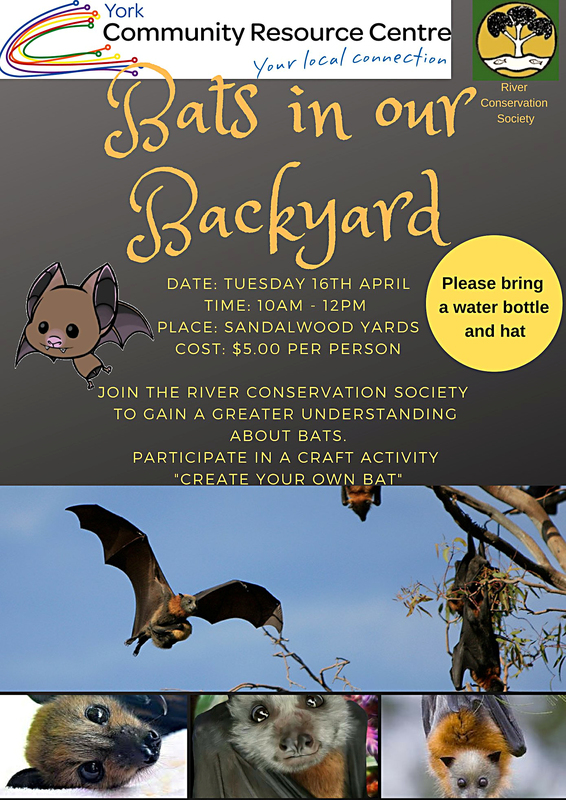 Join the River Conservation Society to gain a greater understanding about bats. Join us for this activity in the April school holidays. We love to get kids involved with nature and bats hold a special place in our ecosystem. We don’t have fruit bats but several other species pay us night visits – what do they look like? What are they feasting on? Bring your children along to find out. Register now at the York Community Resource Centre as there are limited places. We are so lucky to have Zoologist, Botanist and Bat Carer Tony Hodge donate his time to come and give a talk on Bats In Our Backyards. 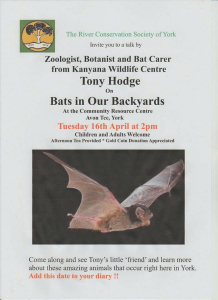 Come and learn about these amazing animals that occur right here in York! 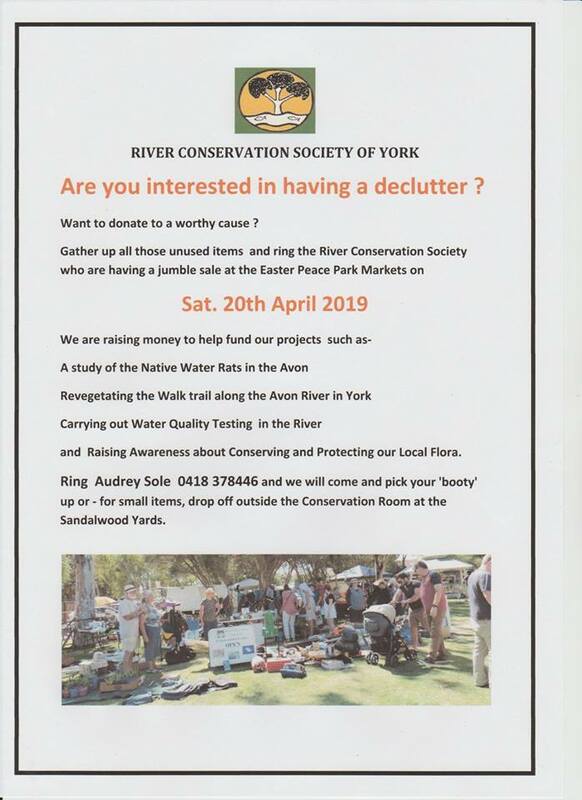 The next River Conservation Society General Meeting will be held on Saturday 30th March 2019 at 10.00am. The meeting will be held at the RCS office located at Sandalwood Yards, Avon Terrace. All RCS members and volunteers are encouraged to attend. Please bring a plate of food to share. Tea and Coffee Provided. Looking forward to seeing you all there. The RCS has its next General Meeting on Sunday Feb. 24th – 10am at the Sandalwood Yards, Avon Terrace, York. All members, volunteers and interested persons are encouraged to attend. See you all there. Busy Bee followed by GM/lunch. Bring water/gloves/spades/wheelbarrow/hat/sunscreen and general gardening implements for a clean up. This is a half day event that will cover theory and practical use of field cameras for fauna surveys. How to set up cameras and how to deploy into the field to get the best results for your efforts. Please RSVP – info@riverconservationsociety.org with your name number people attending. 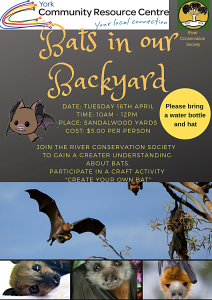 The River Conservation Society and the CRC have worked together to plan the first children’s activity for the April School Holidays. 18 children gathered to learn more about the Avon River’s ecosystem. We had lots of fun identifying many plant, animal and insect species. We even dredged a pool looking for macroinvertebrates which are an important food source for the many birds we see down on the water. Tree’s and shrubs were potted up and taken home to look after until the next activity in the July holidays – July 10th, when they will be planted along the Avon walktrail. We listened to 4 different kinds of frogs and learned thier names – the Banjo, Motorbike, Wheatbelt and Moaning Frogs. The children produced a large poster displaying some of the life along the Avon which we need to protect by keeping the river healthy. You can see this proudly displayed in the front window of the CRC. Sarina, Penny, Rosie and Audrey had a lot of fun leading the children to learn more about our river and look forward to our next holiday activity. We would like to thank Rob Cameron for allowing us to use the Coffee Carriage as our work area. Our next water rat Survey field days will be held on Saturday 5th and Sunday 6th in York, WA. Meeting at RCS office at Sandalwood Yards, Avon Trce at 10.00am for briefing before heading out in the field. Those with kayaks are welcome to bring them along. Children must be accompanied by parents. Join us for both days or just choose one and participate for as long as you wish. The River Conservation Society is celebrating the return of its herbarium collection to their premises at the Sandalwood Yards on Avon Tce. The collection was moved to King’s Park for storage due to a lack of volunteers involved with flora collection. The herbarium contains over 2500 specimens of flora collected within the York Shire. There is also a large lichen collection. The herbarium is an important resource for the York Shire and is in the process of being updated and expanded. We are inviting anyone that would like wildflowers identified from roadsides, reserves or their property to contact us on 96 411428 (Audrey). Please remember that picking wildflowers is not encouraged and a good photo is usually enough to make an identification. If you would like to view the herbarium you are most welcome. We are often at the Sandalwood Yards on Tuesday from 1.30-3.30 but you are best to ring and make sure. The RCS AGM was held on the 27th May and we are happy to see that our member list and enthusiasm is growing. 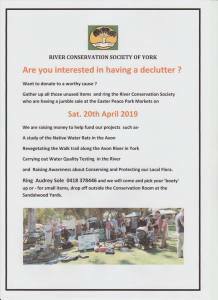 If you are interested in environmental or conservation issues in the York Shire or just want to get out in the bush and learn more about its wonderful assets please contact us on the above phone number or at info@riverconservationsociety.org. Our water rat project is in full swing with surveys being conducted along the Avon River. Heavy summer rains and high river water levels have made tracking these rodents very difficult but with water levels now dropping it has been easier. Over the last month RCS members have been visiting potential areas collecting data and having fun exploring the riverine areas and paddling about the river on warm days. It has also been an interesting exercise discovering other native (and not so native) fauna living along the riparian zones of the Avon. A good number of oblong tortoises (Chelodina oblonga) have also been sighted along the river which is a good sign and a positive outcome resulting from previous RCS tortoise surveys and recovery programmes. People interested in having some fun and assisting the RCS with these activities please contact the RCS at info@riverconservationsociety.org. Great Cocky Count, Monday 26th February – click here. On the 14th and 15th of October, the Wheatbelt Natural Resource Management ran a Bioblitz in 3 conservation reserves west of York – Oswald Sargent, Wambyn and Mt Ronan. Anyone interested in discovering what natural flora and fauna resided around our area was invited to attend. Experts in flora and fungi, reptiles and invertebrates led small groups in 3 chosen reserves for the survey and noted down the different species they found. River Conservation Society members and volunteers were proud to take part in the BioBlitz survey and are looking forward to participating in Wheatbelt NRM holding the 2018 BioBlitz. The greatest thrill we have had in 2017 is to FIND A NEW SPECIES !! As yet an unnamed species of Androcalva, several plants were located on a degraded roadside in York and the FIRST TO BE FOUND IN THE WORLD !! Click here for more details. The Avon Park Working Group was formed by the York Shire in 2016 / 2017 to explore the feasibility and development of concept plans for the redevelopment of Avon Park located in the York Town Precinct on the banks of the Avon River. This group met on numerous occasions throughout the year discussing and analysing what could be done to upgrade this fantastic piece of infrastructure linking the Avon River to the Towns business precinct. The group was incredibly proactive in its approach and worked very well together to come up with a feasible and achievable solution to restore this beautiful and historic area for the use and relaxation of the York community and to encourage tourism to the town. We encourage the York community to show your support and promote the Avon Park Redevelopment for the benefit of the town and the York community. The River Conservation Society recently manned an exhibition marquee at the York agricultural show in September this year. The societies members and volunteers used this event to promote the societies conservation projects, encourage participation in the societies events and bring to the attention of the community the fantastic diversity of native flora and fauna on their doorstep. The York community was extremely interested in the activities the society conducts and was enthusiastic in its support for our conservation efforts. The shows events on the day were fantastic and drew big crowds form all over Perth and the York community. The weather was exceptionally good on the day with a bright blue sky and fine sunny day. The society shared the display marquee with the York Wildflower Society and the Beverly Native Fauna Rescue Group which proved popular with show attendees and those with a special interest in our native flora and fauna. A big thankyou to all our members and volunteers that manned the marquee throughout the day and helped set up / pack up the societies display which generated great interest. A special thanks to Audrey and her magnificent team of helpers! The day was also an opportunity to introduce our newly purchased field microscope equipment to RCS members and the public and it certainly proved to be an attraction with both young and senior age groups. This equipment allows our members and volunteers to bring to life microscopic flora and fauna for detailed visual viewing on a large screen such as a laptop or tablet. With this new equipment, we can capture still photographs or movies of specimens for on the spot or later analysis before returning the sample to its field of origin. This equipment can also be utilised in an indoor environment. The RCS would like to take this opportunity to sincerely thank the Wheatbelt NRM for its generous support and funding that enabled the River Conservation Society to purchase this equipment to further make accessible conservation education for its members, volunteers and the public.